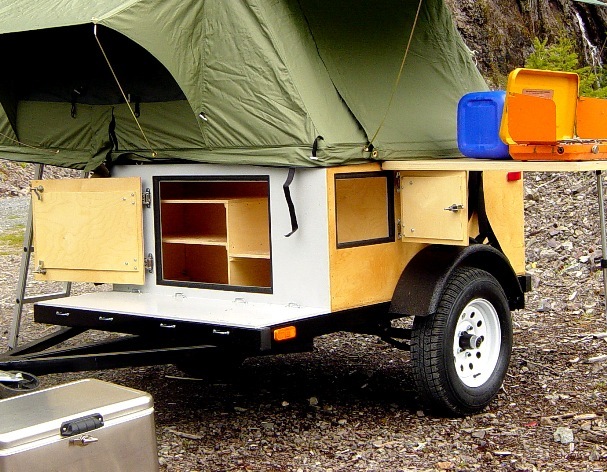 One feature of an Explorer Box is the ability and space to personalize and tailor it to your style of camping. An area easily adjusted is the front and side compartments. Depending on the gear you pack, the height and shelves are customizable. The first picture is a standard Explorer Box, The second is one with a smaller side door that has the back wall removed to connect the front and side compartments. A common need for the smaller side door is to accommodate larger 13” tires and wheels. Notice how the fender comes forward into the area where the door is on the standard Explorer Box. To make this work the door also needed to open to the side verses down.